If you find times that you are to focused on your problems – take the time to focus on your blessings and add all of the things around you that you take for granted. This will always tip the scales in your favor as it outweighs your problems with your blessings. One of the smallest things we take for granted is laughter. Do you realize that laughter will reverse the stress response? Laughter relaxes the entire body by triggering the release of endorphins that promote that overall sense of well being. 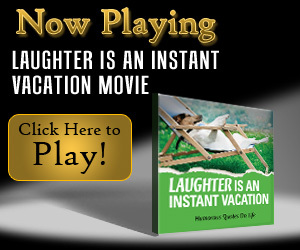 So stop now and add a few laughs to your day for a welcomed stress reliever by taking a few minutes to watch this 3 minute movie, "Laughter Is An Instant Vacation." The movie is a compilation of humorous quotes and photography that will bring a smile to all. Don't forget to foward and share this with family and friends that need a stress break. Click below to join me on Facebook for daily tips and techniques to relieve stress.